“Health Care Reform and the Future of American Medicine” will be explored by Dr. Ezekiel Emanuel at the Annual Meeting of the Jewish Social Policy Action Network on Wednesday, June 6. 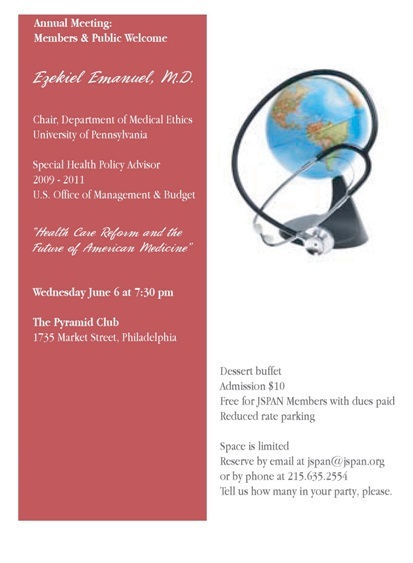 Dr. Emanuel, the new Chair of the Department of Medical Ethics and Health Policy at the University of Pennsylvania, will be guest speaker at the JSPAN event, which will be held at 7:30 p.m. at The Pyramid Club, 1735 Market Street, Philadelphia. During the drafting and enactment of the Affordable Care Act, Dr. Emanuel served as special advisor for health policy to the director of the Office of Management and Budget in the White House. He founded the Department of Bioethics at the National Institutes of Health. Dr. Emanuel trained at Harvard, Beth Israel Hospital in Boston and the Dana Farber Cancer Institute, developing a specialty in breast oncology. He has served on the faculties of Harvard, Dana-Farber and the Kennedy School of Government, and has written or edited nine books and more than 200 scientific articles. He is a columnist for the New York Times as well as a frequent television commentator. Health care reform is a major focus of the Jewish Social Policy Action Network (JSPAN), which develops policy and action programs for positive change, to advance equality and opportunity in our nation’s pluralistic democracy. Most recently JSPAN has presented educational programs on end of life choices, the death penalty, and international criminal law that has developed from the Nuremberg trials. The Annual Meeting is an educational event, open to the public. Space is limited for the Annual Meeting and reservations are required. The cost is $10, including the Pyramid Club dessert buffet. JSPAN members with 2012 dues paid are free. Reduced rate parking is available. For reservations or additional information, call (215) 635-2554. Education Voters of Pennsylvania is organizing a Statewide Call to Action for Public Education on Wednesday, May 23, 2012. As June begins, state legislators will start to work on their budget proposals and start negotiating what the final budget will look like. In February, Governor Corbett proposed a budget that will cement the $900 million cuts he gave to public education funding. You can help stop this from happening again. Mark your calendar and plan to take just 10 minutes to call the Governor and your State Representative and Senator to tell them no more cuts. You can find more information, including links, phone numbers and a downloadable call guide at www.educationvoterspa.org. In about two dozen states across the country, the insurance marketplaces at the heart of the 2010 health-care law remain in limbo, with Republican governors or lawmakers who oppose the statute refusing to act until the Supreme Court decides its constitutionality. In states with Democratic governors, such as New Hampshire and Minnesota, it is often Republican-dominated legislatures that are causing the hold-up. And in six states where Republicans hold both branches of government, including Kansas and South Dakota, state assemblies haven’t even considered laws to establish the marketplaces. China, Mexico and other countries far less affluent are working to provide medical insurance for all citizens. It's viewed as an economic investment. WASHINGTON — Even as Americans debate whether to scrap President Obama's healthcare law and its promise of guaranteed health coverage, many far less affluent nations are moving in the opposite direction — to provide medical insurance to all citizens. China, after years of underfunding healthcare, is on track to complete a three-year, $124-billion initiative projected to cover more than 90% of the nation's residents. Mexico, which a decade ago covered less than half its population, just completed an eight-year drive for universal coverage that has dramatically expanded Mexicans' access to life-saving treatments for diseases such as leukemia and breast cancer. In Thailand, where the gross domestic product per person is a fifth of America's, just 1% of the population lacks health insurance. And in sub-Saharan Africa, Rwanda and Ghana — two of the world's poorest nations — are working to create networks of insurance plans to cover their citizens. "This is truly a global movement," said Dr. Julio Frenk, a former health minister in Mexico and dean of the Harvard School of Public Health. "As countries advance, they are realizing that creating universal healthcare systems is a necessity for long-term economic development." Below is a remarkable document. It's a memo circulated by Jan van Lohuizen, a highly respected Republican pollster, (he polled for George W. Bush in 2004), to various leading Republican operatives, candidates and insiders. It's on the fast-shifting poll data on marriage equality and gay rights in general, and how that should affect Republican policy and language. And the pollster's conclusion is clear: if the GOP keeps up its current rhetoric and positions on gays and lesbians, it is in danger of marginalizing itself to irrelevance or worse. HARRISBURG - Wartime welder, civil-rights marcher, world traveler, voter - Viviette Applewhite of Philadelphia's Germantown section can boast of having been all those things. On Tuesday, she added another title: plaintiff. Applewhite, who is 93 and uses a wheelchair, became the lead plaintiff in a lawsuit filed here in state court by the ACLU and the NAACP challenging Pennsylvania's new law requiring voters to produce a driver's license or other photo identification before they are allowed to vote. Just two hours after a U.S. district judge stopped a Texas law that would have eliminated Planned Parenthood's participation in the state's Women's Health Program, Federal Appeals Judge Jerry E. Smith issued an emergency stay that lifted that order. In the appeal for the emergency stay, a team of attorneys led by Texas Attorney General Greg Abbott compared Planned Parenthood to a terrorist organization. "Planned Parenthood does not provide any assurance that the tax subsidies it receives from the Women’s Health Program have not been used directly or indirectly to subsidize its advocacy of elective abortion," Abbott wrote in his motion to stay the injunction. "Nor is it possible for Planned Parenthood to provide this assurance." "Money is fungible, and taxpayer subsidies -- even if 'earmarked' for nonabortion activities -- free up other resources for Planned Parenthood to spend on its mission to promote elective abortions ... (because '[m]oney is fungible,' First Amendment does not prohibit application of federal material-support statute to individuals who give money to 'humanitarian' activities performed by terrorist organizations)." The stay was later vacated by the Court of Appeals, and the lower court’s injunction prohibiting defunding of Planned Parenthood was reinstated. TOPEKA, Kan. (AP) — A bill designed to prevent Kansas courts or government agencies from making decisions based on Islamic or other foreign legal codes has cleared the state Legislature after a contentious debate about whether the measure upholds American values or appeals to prejudice against Muslims. The Senate approved the bill Friday on a 33-3 vote. The House had approved it, 120-0, earlier in the week. The measure goes next to Republican Gov. Sam Brownback, who hasn't said whether he'll sign or veto the measure. The measure doesn't specifically mention Shariah law, which broadly refers to codes within the Islamic legal system. Instead, it says that courts, administrative agencies or state tribunals can't base rulings on any foreign law or legal system that would not grant the parties the same rights guaranteed by state and U.S. constitutions. How does the New Testament appear to Jewish eyes? A new scholarly volume provides both close-up and wide-angle views of the Christian Bible’s 27 books, and reveals the Jewish underpinnings of nearly every part of it. In 1881, Nietzsche heaped scorn on Christians for what he considered a prime example of the art of reading badly. "I mean the attempt to pull the Old Testament from under the feet of the Jews with the assertion that it contained nothing but Christian teaching and belonged to the Christians as the true people of Israel, the Jews being only usurpers." Given how long Christians have regarded the Hebrew Bible as a prologue - a collection of prophesies and prefigurations that found their fulfillment in the life, death and resurrection of Jesus - we know a great deal about how Christians have read or willfully misread what they call the Old Testament. But how did - and does - the New Testament appear to Jewish eyes? In "The Jewish Annotated New Testament," Amy-Jill Levine, of Vanderbilt Divinity School and author of the 2006 book "The Misunderstood Jew: The Church and the Scandal of the Jewish Jesus," has teamed up with Marc Zvi Brettler, a professor of Bible at Brandeis University, to reclaim the New Testament as an integral part of Jewish literature. The result is a landmark volume that in its reading of the New Testament as a Jewish text reverses the usual direction of appropriation - with sometimes surprising effect.